^ a b Peter Grubb, "Rhinocerotidae," Mammal Species of the World, (3rd ed. ), Volume 1, Don E. Wilson & DeeAnn M. Reeder (ed. ), Johns Hopkins University Press, 2005, p. 634-636. ^ Macdonald, D. (2001). The New Encyclopedia of Mammals. Oxford University Press, Oxford. ISBN 0198508239. ^ Groves, C. P. (1972). "Ceratotherium simum". Mammalian species. 8 (8): 1–6. doi:10.2307/3503966. JSTOR 3503966. ^ Martin, E. B. 1984. "They're Killing off the Rhino." National Geographic, 165:404-422. ^ Christelle Tougard, Thomas Delefosse, Catherine Hänni und Claudine Montgelard: Phylogenetic Relationships of the Five Extant Rhinoceros Species (Rhinocerotidae, Perissodactyla) Based on Mitochondrial Cytochrome b and 12S rRNA Genes. Molecular Phylogenetics and Evolution 19, 2001, S. 34–44. ^ Lucas, S. G. et al. 1981. "The Systematics of Forstercooperia, a Middle to Late Eocene Hyracodontid (Perissodactyla: Rhinocerotoidea) from Asia and Western North America." Journal of Paleontology, 55:826-84 1. ^ Lacombat, Frédéric (2005). “The evolution of the rhinoceros”. In Fulconis, R.. Save the rhinos: EAZA Rhino Campaign 2005/6. London: European Association of Zoos and Aquaria. pp. 46–49. ^ Robinson, Terry J.; V. Trifonov; I. Espie; E.H. Harley (January 2005). “Interspecific hybridization in rhinoceroses: Confirmation of a Black × White rhinoceros hybrid by karyotype, fluorescence in situ hybridization (FISH) and microsatellite analysis”. Conservation Genetics 6 (1): 141–145. doi:10.1007/s10592-004-7750-9. http://www.springerlink.com/openurl.asp?genre=article&doi=10.1007/s10592-004-7750-9. ^ Richard Estes (1991). The Behavior Guide to African Mammals: Including Hoofed Mammals, Carnivores, Primates. University of California Press. pp. 323–. ISBN 978-0-520-08085-0. https://books.google.com/?id=g977LsZHpcsC&pg=PA323. ^ Hutchins, M.; M.D. Kreger (2006). “Rhinoceros behaviour: implications for captive management and conservation”. International Zoo Yearbook (Zoological Society of London) 40 (1): 150–173. doi:10.1111/j.1748-1090.2006.00150.x. 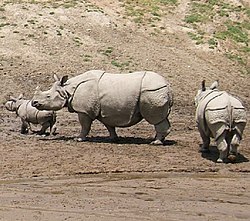 ^ Wildlife: Rhinoceros. AWF. Retrieved 2012-02-24.